The minute my husband cracked the door, a swarm of angry wasps emerged. “Watch out. They came out!” I yelled, afraid he would poke his arm out with all of those wasps buzzing around. But I shouldn’t have worried, because he never opened the door. A few seconds later, my husband came out of the barn and rubbed the back of his head. An angry wasp had come through a crack in one of the windows and found him. I’m sure that things would have been way easier had we got our game on when the nest was small. Do you ever put things off? I don’t think we’re the only ones who ignored a little problem until it grew to a size way harder to handle. Procrastination can be a major pitfall can’t it? 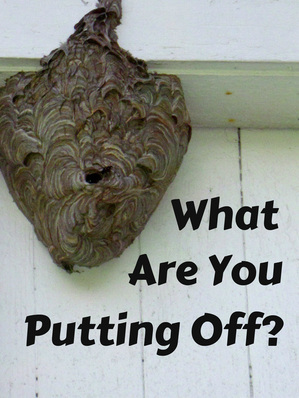 like wasp’s nests, but consequences can grow even more severe when it comes to dealing with problems with people and I think most especially … kids. Old Eli must have thought that he was an okay enough dad. After all, he was a high priest and judge of Israel. Surely God would give him a break when it came to his disobedient and disrespectful sons right? I mean he was busy doing the work of the Lord after all. But some of you may know how that story goes. God didn’t think it was okay that Eli’s sons were wicked. And the bad boys, namely Hophni and Phinehas, weren’t little by the time their deeds are mentioned in the Bible. They were grown men who were actually serving as priests like their dad. I’m guessing that Eli must have procrastinated in the areas of correction and discipline when the boys were little. It was no secret to him what his sons were doing. As parents and grandparents, we have the responsibility on our shoulders to instruct and correct the children in our lives. When we procrastinate -- well now, we can have a big problem on our hands. Just like our old wasp’s nest. Procrastination plagues all of us at one time or another, and although it may not seem like such a big deal when we’re doing it, we can actually miss a blessing when we indulge in it. Joanne Farro in her blog post “Putting off Procrastination” over at www.jesusfreakhideout.com says this, “While procrastination robs us of blessings, God promises us great rewards for practicing diligence. Taking care of a problem or a project today can put us ahead of the game. So let’s enjoy life – and not put it off! He who observes the wind [and waits for all conditions to be favorable] will not sow, and he who regards the clouds will not reap.